Welcome back to another edition of the Stamp Review Crew! 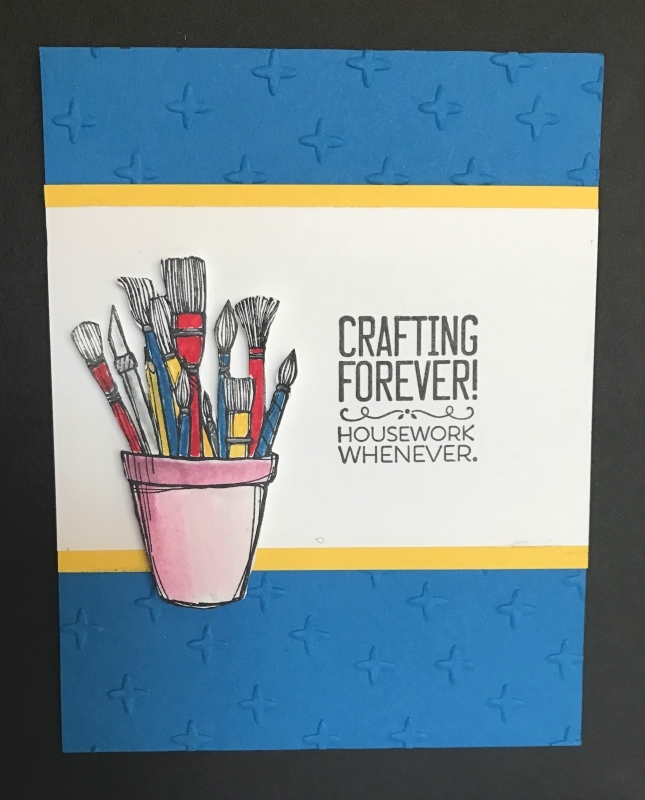 This week we’re featuring the fabulous Crafting Forever stamp set. 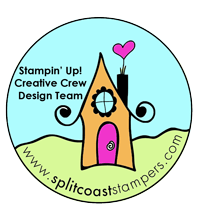 If you don’t know, the Stamp Review Crew is a group of International Stampin’ Up! demonstrators that show one Stampin’ Up! stamp set at a time, every first and third Monday’s of the month. By focusing on a single step, we give you tons of ideas and inspiration for the set if you have it, and may just entice you to buy it if you don’t. You’ll want to visit each blog to see all the creative ideas. I love this stamp set – it has something for just about every kind of crafter. I was fortunate enough to receive this stamp set ahead of the On Stage event in April. I made several cards using this set to be displayed at the event. First up are the pens. I love that each pen has a design to color in. Here I used Daffodil Delight, Bermuda Bay and Real Red. I also used some of the new Bermuda Bay stitched satin ribbon that was part of my catalog sneak peek. Next up is the pot of paint brushes. Yes – I cut around all those brushes, but it really wasn’t that bad. The last one is my favorite. It’s not really obvious in the picture, but I stamped the small jar from the Jars of Love set on a piece of window sheet. I stamped the wooden spool twice and colored in the thread in Real Red and Daffodil Delight. The final peg I stamped and wrapped bakers twine around and twirled the end off the card. I really like the way it turned out. I hope you like my cards. 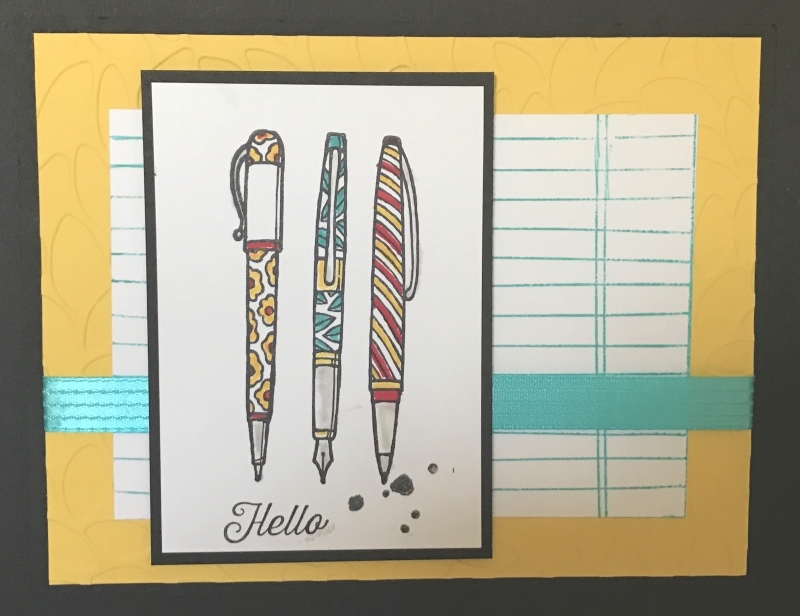 Now hop on to Yapha’s blog to see what fun projects she has to show. Thanks for visiting! Beautiful array of cards! And wow all that fussy cutting – you are good! Great cards, Nancy! I love the real twine on the last one. Super cute & clever! Oh my, that was a lot of fussy-cutting! But it’s so worth it to get that awesome 3-D effect! Your cards are all gorgeous, but I have to agree – the last one is my fave, too! Fun cards, Nancy! My favorite is the jar with the spools. Love that you used the top spool with Baker’s Twine. Your fussy cutting is exquisite! Three beautiful cards with so much detail in each. Love the real Baker’s twine on the spools. 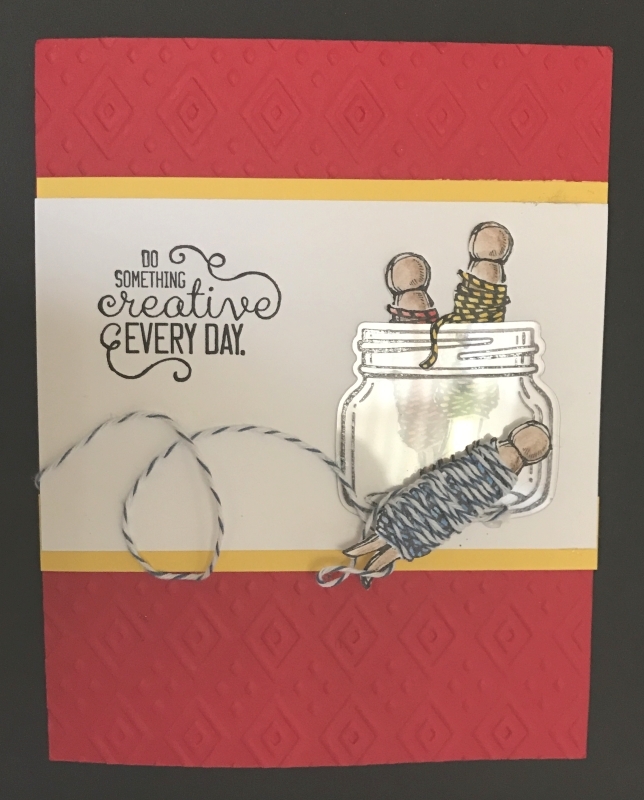 Love the clothes pins in the jar with the bakers twine…so clever! Cute cards with lots of fun “extras”. I love the baker’s twine one! Beautiful cards! I love the little jar with the baker’s twine. Love this idea and execution.